According to the article, biogas provides a sustainable fuel that reduces people’s reliance on traditional fossil fuels. It also cuts the amount of harmful pollutants and carbon dioxide released into the air. What other advantages might it provide? Can you think of any disadvantages? 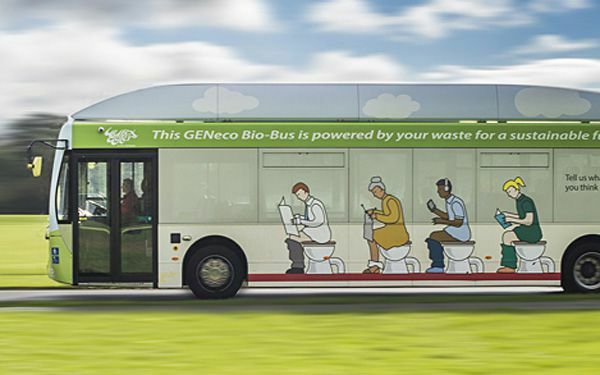 Biogas is, in part, rendered from human waste. Do you think people from all cultures would be open to making and using a fuel from this source? Why or why not? Do you think the product’s environmental benefits could help people overcome their misgivings? According to the article, biogas can be rendered from sources including landfills, wastewater, manure, and agricultural waste. Some biofuels that are currently produced come from food products, such as corn. World hunger rates are on the rise. Do you think food sources should be used to make fuels when so many other sources are available? Why or why not? Assign partners or divide the class into small groups. Tell students to imagine that they work for an advertising firm. Their firm was just hired to create a television commercial about a new product. Instruct groups to list key details about their product. Then direct them to identify their market. Explain that who they are selling to will greatly affect the content, style, and design of their commercials. Inform students that their commercials must be truthful. However, the point of a commercial is to sell. It is up to them to identify the best way to inform, persuade, and/or entertain potential customers. Once students have a general idea in mind, challenge them to create a storyboard that outlines their ideas for the commercial. Each storyboard must be at least six frames long. Each frame must contain dialogue and visuals. Important details about their product must be clear, and the approach taken must be a suitable fit for the intended market. Invite students to present their storyboards to the class. Evaluate the message and marketability of each commercial. Have students complete the project in small groups. Instruct them to identify three key facts they want people to know about their product. Tell students to incorporate that information into their storyboards. Remind students to use correct punctuation when writing dialogue. Have students complete the project in small groups. Instruct them to include three key facts they want people to know about their product. Point out that these are not six separate frames but the outline for a story. Challenge them to use a narrator or other technique so their story flows smoothly from beginning to end. Tell students to write a brief background profile for each character that appears in the storyboard. Challenge them have the characters then interact in their commercial in a way that makes sense. Discuss reasons why the resulting commercial is a good fit for the intended market. Encourage students to create two commercials for the same product but for different target audiences. Evaluate each to assess the suitability of each approach for intended market.